The Dianna Series Female mannequins come in six different poses with three different head styles. With each pose you can choose Abstract, Oval or headless. In White only Create a sophisticated look to your store windows and interior by adding this contemporary Dianna Mannequin. This striking Mannequin with arms by sides features a stylish cameo white finish which provides the perfect backdrop for your merchandise. Available with an abstract face, faceless-oval head, and headless. Comes complete with detachable arms, hands, leg, lower torso and a sturdy tempered glass base with calf rod mount. Dimensions for the abstract and faceless-oval head mannequin: 71"H, Bust 34", Waist 25", Hip 35", Neck 12", Heel Height 3". 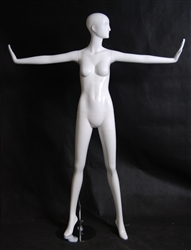 Image shows the abstract head Dianna Mannequin.